Sting isn’t usually thought of as a geek hero. But, if you look carefully at the cover of the Police single “Wrapped Around Your Finger”, you’ll see that he is proudly wearing a symbol of geekdom from the late 1970s and 1980s. 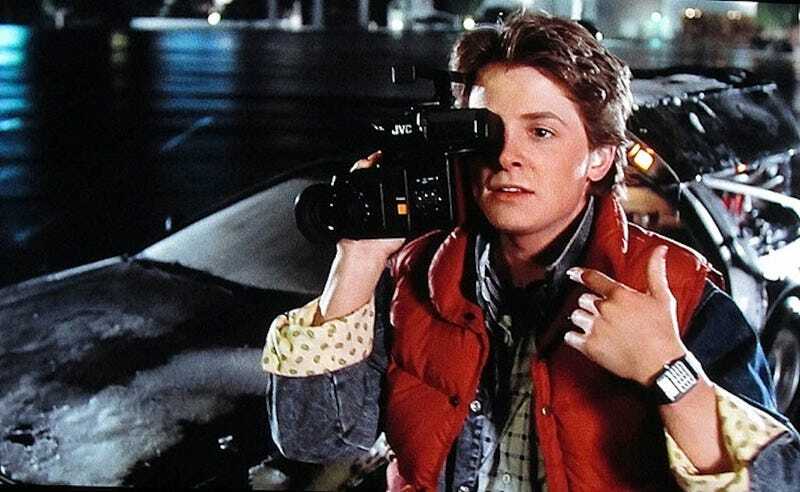 Similarly, geek icon Marty McFly is seen to be wearing the same symbol in Back To The Future: a calculator watch. In an era before cell phones got small enough to carry, a calculator watch was a sure sign of someone who cared about the geeky stuff. 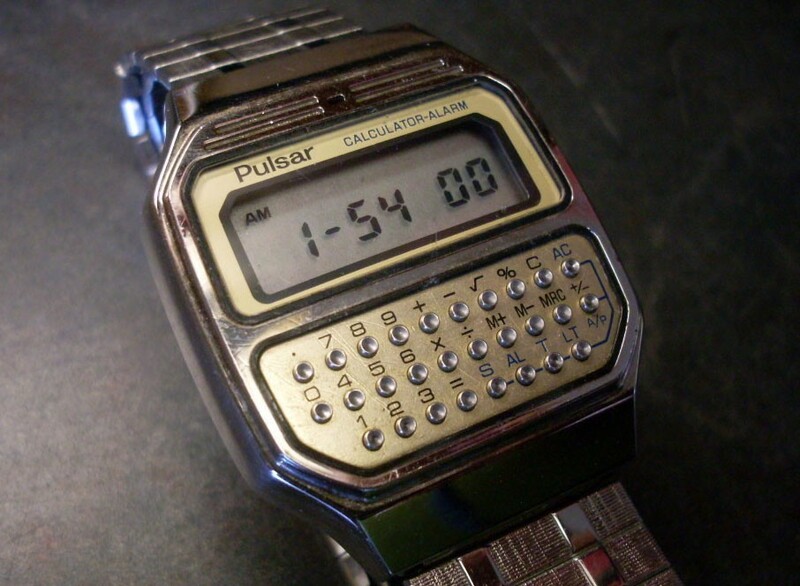 The first calculator watch was launched in 1975 by Pulsar, a division of the Hamilton Watch company. The trend-setting (and rather chunky)Time Computer Calculator 901 model had a numeric keypad and function keys on the face, and could add, divide, multiply and subtract. A step-up model (the 902) also offered percentages. The buttons were very small, so the watch came with a combination stylus and pen that could be used to tap them. These were premium models, and the first 100 were made from solid gold and cost about $4000 (one is now on sale on eBay for $27,000). Subsequent models were made from steel and cost a more reasonable $50. You can read more about this watch on OldPulsars.Com. 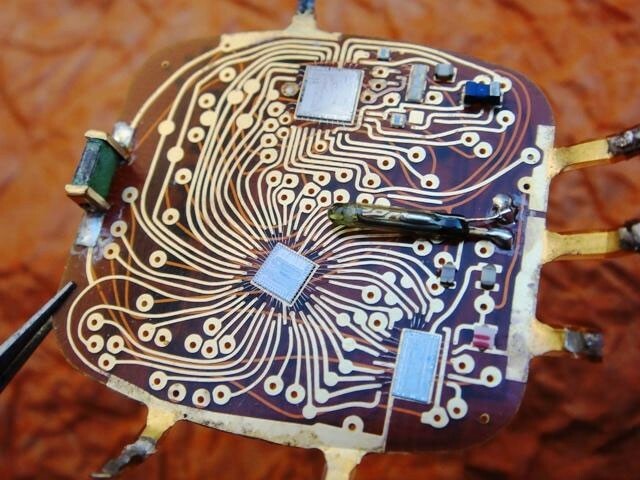 The 901 also had one of the most beautiful circuit boards ever, with gorgeous, hand routed swirls and curves that would give a modern engineer nightmares. 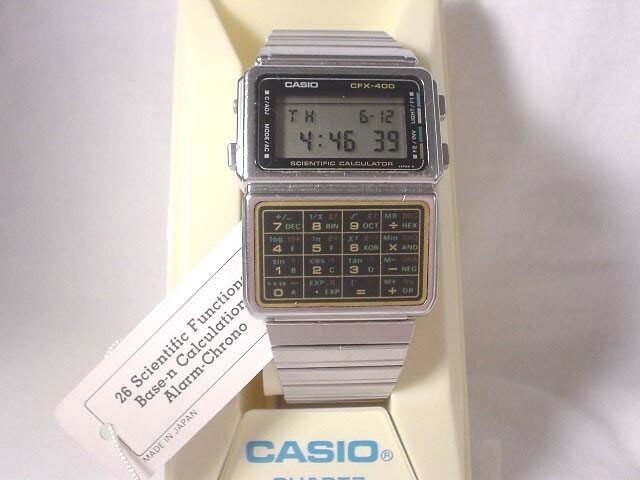 Although the Pulsar model was popular, the calculator watch as a fashion item did not really take off until the late 1970s and early 1980s, when Japanese manufacturers like Casio and Seiko started selling models. In particular, Casio popularized the concept, with models ranging from the simple (the CA-50, which included a basic calculator with 16 buttons) to the outrageously complicated, like theCFX-40. This large watch had 16 buttons that supported 3 functions each, including such mathematical esoterica as boolean logic (with OR, XOR and AND functions), hexadecimal calculations and logarithms. A more robust metal-cased version called the CFX-400 was also available. Other manufacturers took up the challenge, stuffing even more features and keys into their devices. The highlights of this bizarre race onto geeky schoolboys wrists included the Pulsar Y739, which offered a bewildering 28 keys on the watch face. Costing a cool $105, this watch included a large number of features, but was completely unusable by everyone but the most slender-fingered or the toothpick-equipped. Computer and calculator manufacturers also tried their hand in this market. At the time, HP was a big name in calculators, and the company rolled some of this expertise into the HP-01 calculator watch. HP somewhat arrogantly described it as “ a new dimension in time management and personal computation”. Rather than the usual LCD display, the 01 used a red LED display with 8 digits. It had 28 small keys on the face, but some were raised to make them easier to find. It was available in gold, black or steel models. Citizen decided to take a different approach, and created what has been described as the holy grail of calculator watches — the Citizen 9140A. This monstrosity has an amazing 41 buttons around the rim of the watch face, with features such as square root, sin, cos, tan and cube root functions. If that wasn’t enough, some of the buttons have a second function for things like base(n) calculations, logs and polar co-ordinate conversions. It is also the only watch to include support for statistical functions, although anyone brave enough to use them is doing so against all odds. Although it looks utterly unusable, the users of this watch claim that it works quite well: they say that the arrangement of the buttons on the outside edge makes them easier to find than the conventional grid, and the buttons do not require much force to press. Mind you, there are not that many users of this particular watch: only a few hundred were made, and they are extremely collectible. Calculator watches started to decline in the mid 1980s as cell phones and PDAs became cheaper and more available. People relied on these to tell the time, and watch sales generally fell. Calculator watches were always a niche, and most manufacturers decided to focus on the cheaper, simpler models. Those complex watches with more buttons than the average cell phone still have their fans, though. Although they are not seen on the wrists of many modern celebrities, there are many collectors, and sites such as PocketCalculatorShows Nerd Watch Forum and the Digital-Watch forums are full of collectors and those looking for calculator watches. eBay is also a good place to look, with many classics regularly showing up. We were not able to find any Citizen 9140As on there, though. This post was republished with permission from Richard Baguley and originally appeared on Medium.